The 1100 sqm headquarters for the Leping Foundation is conceived with wellness in mind. 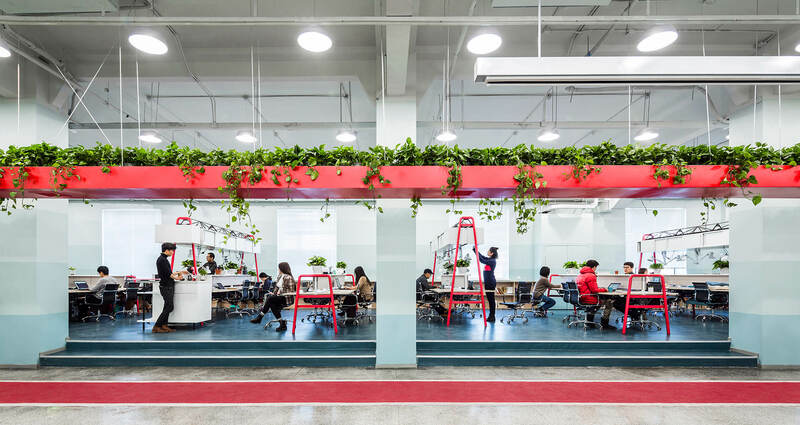 The office houses the Leping Foundation, a non-profit organization known for social innovation and four of their investee companies that work in diverse fields – job training for migrant workers, agricultural research, preschool education, and microfinance. These distinct companies are tied together by a central activity loop of suspended vegetation mirrored by a running track underneath. While intense exercise is mostly disruptive to office work, moderate activity often is not. Simple activity, over a sustained period, can be as beneficial as vigorous exercise. The office is designed around the understanding that physical activity is good for the brain and the layout provides opportunities to move while at work, to vary modes of working, and to rest. Office staff can walk laps around the track while on a call. Others can multitask by conversing while simultaneously cultivating plants. Incorporated into the planted loop is an advanced air filtration system. A significant issue in Beijing, one of the world’s most polluted cities, indoor air quality data is regularly collected, monitored, and displayed in real time above the running track. The vegetables and aromatic herbs from the activity loop and other hydroponic gardens in the space are harvested and prepared on-site for lunch. This daily communal activity takes place next to the activity loop in the open kitchen, an area that extends into the dining and lounge space and runs the length of the office. 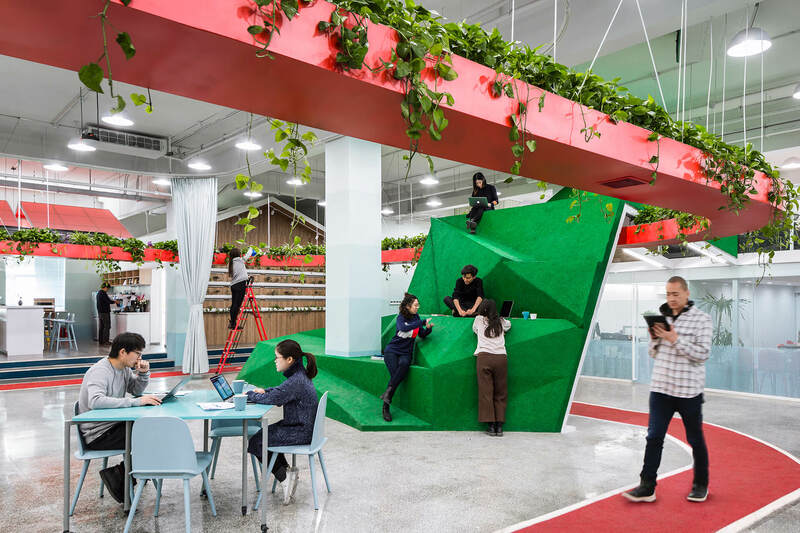 Another location that mixes lounging and working is the ‘mini mountain’ that sits at one of the end of the office space and is intersected by the activity loop. The surface of sloping facets accommodates a variety of postures and is also a way to ‘hike’ up to the mezzanine level. Spaces for specialized activity include a separate gym, a meditation space, and a meeting room. The wall design reminds users of the importance of staying active and changing positions. Gradating bands of blue span the height of the walls and columns at 60cm intervals. Recommended periods of time spent at each height are given and each of these correspond with certain postures and activities, which include laying down, sitting, walking, and climbing. Leping’s innovative work in social impact requires collaboration and interaction between team members, departments, and companies. The workstations are designed by our office and create small social spaces, including mini kitchens and lounge spaces, where spontaneous and informal conversation can take place. The furniture system uses a truss structure that allows storage to be suspended above, freeing up floor space for people to squeeze in for spontaneous discussions. The activity loop interior serves as an event space and a flexible space for incubating social enterprises. It’s populated with Tetris Tables, which can be used individually or combined into various configurations. A People’s Canopy can be moved around and expanded to create a separate meeting space within the central loop area.